Happy Friday! I am so glad it's almost the weekend. I'm even more ready for spring and this little cutie makes me think of warmer times to come. She is call Mimosa on the Bench, and you can find her in the Paper Jewels store. If you have time, pop over to the Paper Jewels Blog and play along with the February challenge for a chance to win a stamp! Image is Bildmalarna colored in with Copics and Bic Mark Its. Paper is SU Sage and Almost Amethyst and Lavendar Lace. DP is misc from my stash, so are the brads. I used the Swiss Dots Cuttlebug embossing folder, and the photo corners are from a Martha Stewart punch. Flowers are PTI and the little flower on the image is accented with Stickles. Nice card. She's a cute image. 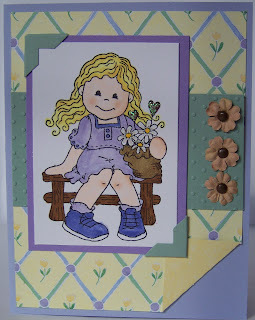 So cute.. Love the layout for this card! Totally cute, love your coloring and paper! Too cute, love the dp! She's too cute...love the layout!